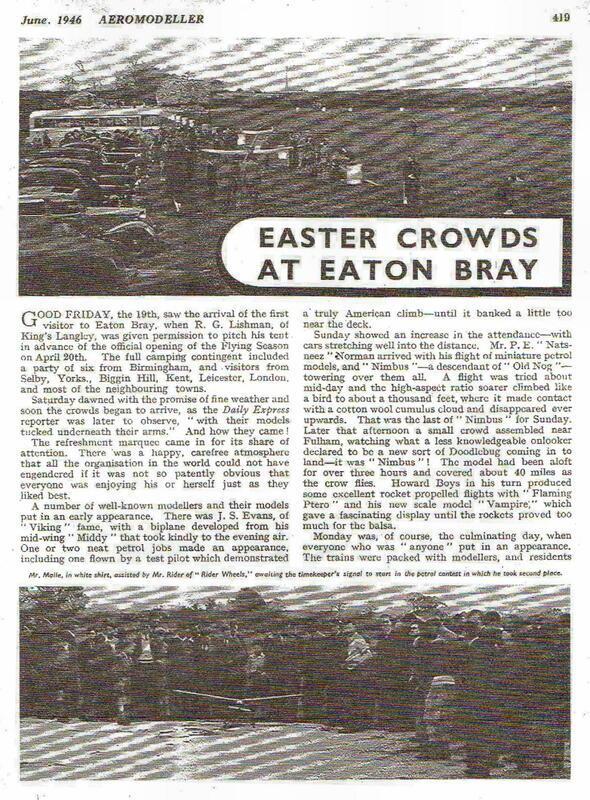 Eaton Bray Sportsdrome was opened in the late 1940s by Douglas Arthur Russell the owner of Aeromodeller Magazine. It was, for a short time, to become the Mecca for model enthusiasts from all over the world. Modelling activities in Britain have always experienced opposition and had restrictions imposed, which have increased dramatically of late. Issues of noise and pressure through commercial and leisure development continue to impact on the hydro lakes and flying sites available. The situation for tethered cars has been even more difficult with no tracks at all in this country since the demise of Mote Park, Maidstone in the 70's. 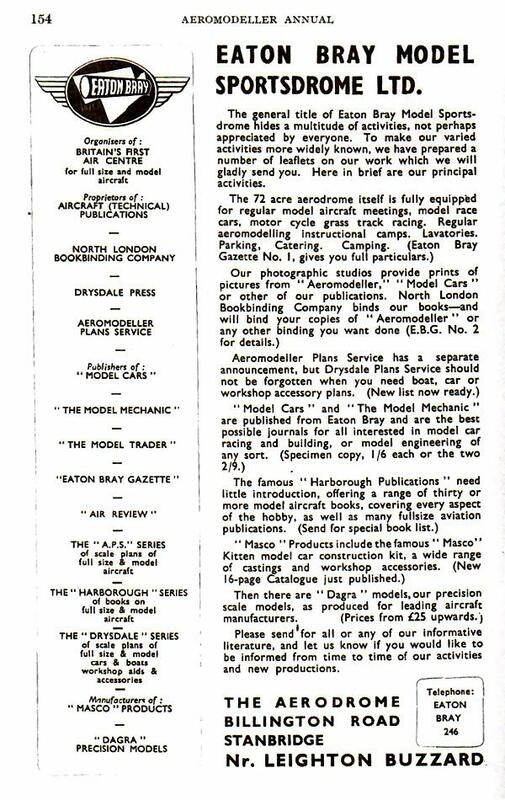 Enthusiasts would love to see a track established in this country and model flyers continue to petition the BMFA to create a central flying site. Yet sixty years ago, such a facility did exist. 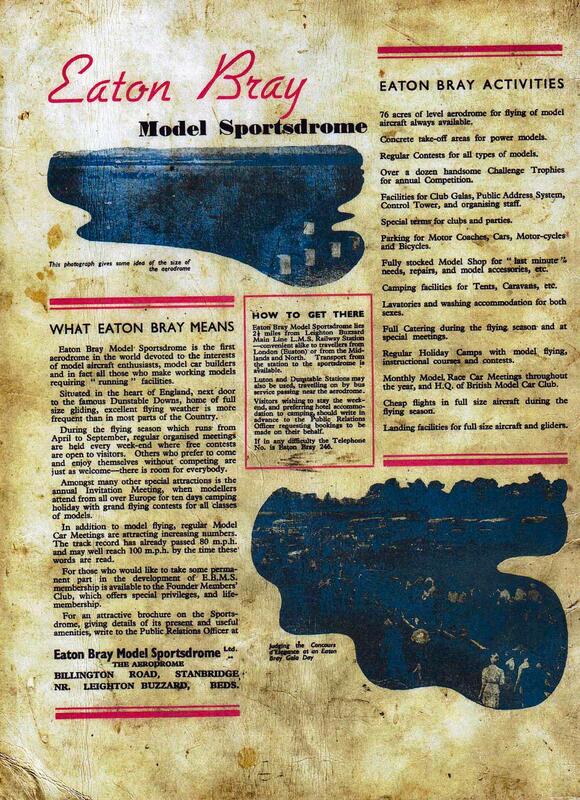 This was the Model Sportsdrome at Eaton Bray in Bedfordshire, and the man behind this modelling mecca was D.A. Russell the Managing Editor of the 'Aeromodeller'. Continue reading this article: D.A. Russell and Eaton Bray. Click here to view the newsreel on the British Pathe website. As stated in last month's Editorial, full facilities and amenities will not be available until next year, but from Saturday September 15th of this year, the Aerodrome will be available on Saturdays and Sundays for the flying of all types of model aircraft from 10 a.m. until 9 p.m.
Adminission charges will be 1s. per adult person, 6d. per person under sixteen years of age. Both these charges will be reduced by half for admission after 3 p.m. on both days. Water for drinking purposes and lavatory accommodation for both sexes will be available free. A limited amount of protection from rain, will, it is hoped, be available, if required. 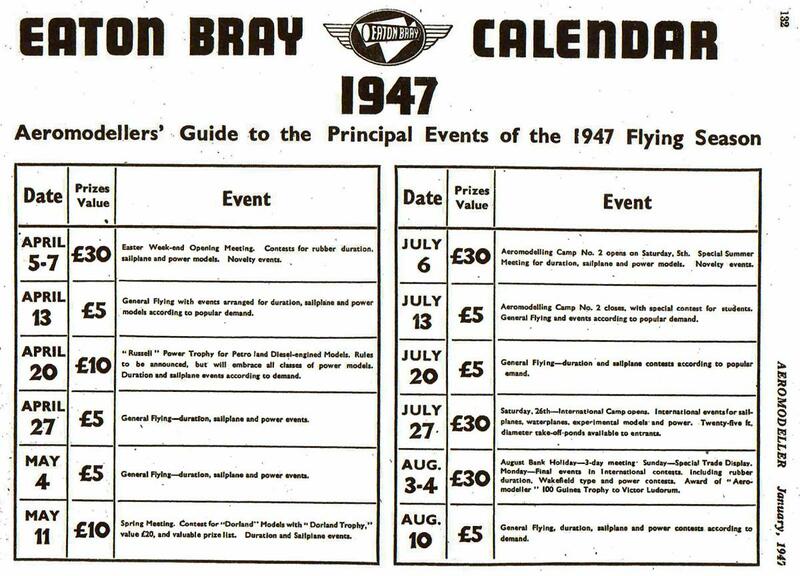 Cars, motor cycles and bicycles may be parked round the sides of the Aerodrome. There will be no organized competitions this year, but club members may organize competitions amongst themselves, subject to non-interference with the flying of other visitors. Flying may take place on any part of the Aerodrome subject to the general directions of the Aerodrome Manager. Owing to the grass having been sown as recently as the Spring of this year, the normal close cropped surface will hardly have been consolidated. Small temporary take-off boards will be available. In the early part of next year, Eaton Bray will be the centre of the worlds first model Sportsdome. Click each image to view the full version. 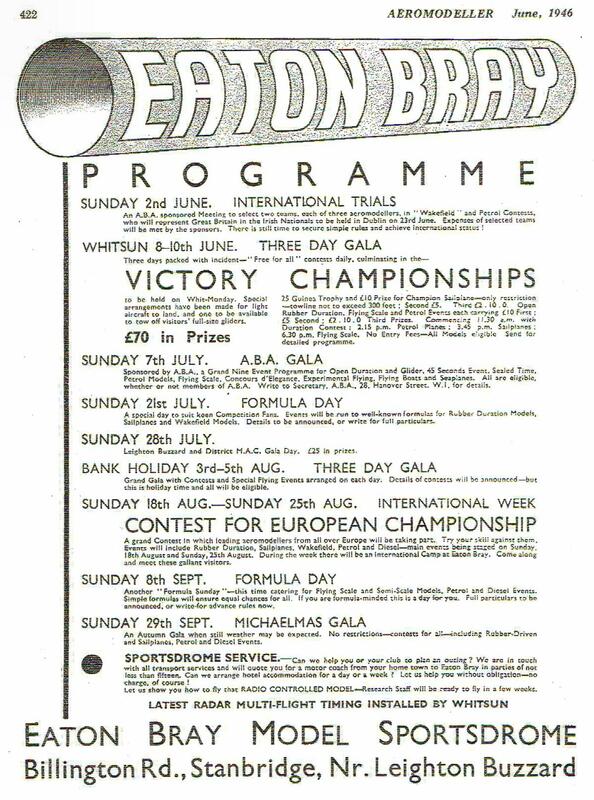 The general title of Eaton Bray Model Sportsdrome hides a multitude of activities, not perhaps appreciated by everyone. To make our varied activities more widely known, we have prepared a number of leaflets on our work which we will gladly send you. Here in brief are our principal activities. Please send for all or any of our informative literature, and let us know if you would like to be informed from time to time of our activities and new productions. This page was created in memory of my late father Bob Palmer. If you have found it useful, then all donations towards IRHH are gratefully received via www.justgiving.com/janetickell.